I tend to try not to know as little about books as possible before I read them. This is because I really dislike spoilers, as I figure that I’m only ever going to get a chance to read something and potentially be shocked by it once, and I want to preserve that, just in case whatever I’m reading turns out to be amazing. Because of this though, I often end up knowing really vague things about a book, and then building it up in my brain to be something completely different to what it actually is, and being disappointed with it, confused by it, or approaching it in completely the wrong way. This book was definitely a case of the latter. The things that I knew about it before I read it were things that I got from the title, the fact that lots of people said it was very good, and that the illustrations were nice. So, in my mind that led me to believe that it would read like a fairytale aimed at children, so it would be a really easy, relaxing, don’t have to think about it too much read. What this book turned out to be was more along the lines of the Alice books. The way that it is written, while not overly complicated, requires close reading as it has so many bizarre details in it. The things that happen in the story are very nonsensical, and I do not mean that in an insulting way at all. However, I only figured this out after reading a few chapters in the same way that I would approach a typical YA novel – reading quickly, and not pausing to absorb much of the language. This was a HUGE mistake, as once I realised and slowed down my pace, I enjoyed the book so much more. If you are someone who tends to read quickly and in the process miss some things, I really recommend slowing down for this book. If you don’t, the already bizarre situation which September, the heroine of the book, finds herself in will make even less sense. It will be worth it. 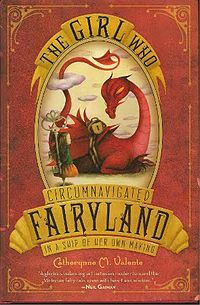 The story follows September, who is taken into Fairyland by the Green Wind and the bizarre things that happen to her there. I’m sure that to summarise the plot further would just confuse everybody (most of all me), so I’ll leave it at that! The book in itself is like a more modern version of the Alice books, but September is a much more compelling protagonist. Although the world around her may not make that much sense, the way that she acts definitely does. I’m sure that as revered as the Alice books are, there must be a LOT of people who have tried to write something similar over the years (although I’ve never come across it). I’m sure that most people would end up being a pale imitation, but the writing here is REALLY GOOD. The story itself is bizarre (as I’ve said about 10 times now, haha), but it doesn’t feel like the characters are being strange just for the sake of it, it feels like they are acting normally. I think this is a testament for how well written the whole thing is, as a lesser author would almost definitely make everything feel forced. In case you haven’t guessed yet, I really liked it. I am looking forward to reading the other installments in the series (which also have amazing titles: The Girl Who Fell Beneath Fairyland and Led the Revels There, and The Girl Who Soared Over Fairyland and Cut the Moon in Two). Before I do that though, I want to go back to the start of this book and read it again, this time giving it the time and attention that it deserves.